A San Bruno resident says he has smelled natural gas in the area for weeks. San Bruno, California (CNN) - The gas line fire in San Bruno, California, that killed four people and destroyed 38 homes is now fully contained with small hot spots, Lt. Gov. Abel Maldonado told reporters Friday. He said the search effort is about 75 percent complete. The fire chief of San Bruno, California, told reporters Friday everyone is accounted for after a massive gas line fire there that killed four people. "We haven't had reports of missing people," said Chief Dennis Haag. 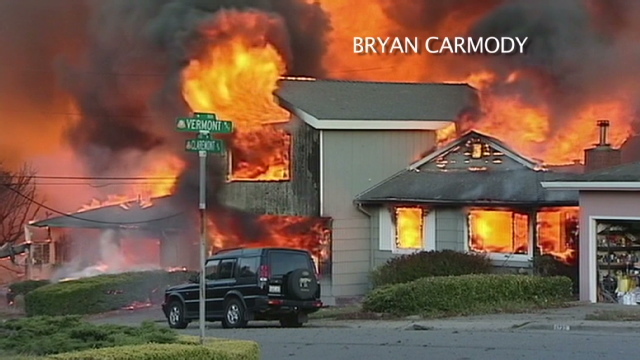 The inferno in the city of San Bruno's normally quiet Glenview neighborhood sent fireballs 80 feet into the air and destroyed or damaged 45 homes. "It looks like a moonscape in some areas," said San Haag, who was visibly shaken at a Friday news conference. California Lt. Gov. Abel Maldonado said he was shocked by the "horrible tragedy." He declared a state of emergency in San Mateo County. i thank god the fire has been contained and proper measures will be taken so that it will happen again. The problem with deteriorating underground gas lines is not new to the natural gas industry. Approximately 20 years ago an entire town was nearly burned to the ground when a similar explosion occurred in Central Missouri. I believe it was Centrailia, MO. After the disaster much of the underground gasline system in Missouri was replaced by the utility companies in order to avoid any further danger from aging deteriorating underground gas lines. The story received national attention at the time and no utility company in the U.S. could be unaware of this potential threat. The part about the man's car bumper melting as he fled for safety just blows my mind. Watching the coverage last night and seeing the flames going high and the fire spreading I am amazed that the death count is so low but I hope it stays low. My thoughts are with the people who experienced this and who lost their homes. I hope that the gas company, who it appears did not investigate the smell of gas leaking for 3 weeks, will step up and help these people rebuild their homes. Our Prayers are with You All. Amen! Before this occured, I had a dream and premonition about it and I sent it to my e-mail for proof. I have much needful information that could help assist, prevent, and inform people everywhere. Our thoughts are with the people in San Bruno.I know what a moonscape looks like and the terror of fire.Kinglake was deverstate by fire in 2008 you never forget. This is just so terrible and sad... As if life wasn't difficult enough... God bless these people during this time of loss..
Before any numbers are given,let's step back,take a deep breath and say wait a minute, what if someone lived alone or an entire household was wiped out by this conflagration? The fact that no one has been reported as missing does not mean that the number stops at four or six. It is hard enough to deal with such a tragedy without inaccurate and hurried information being given out to satisfy the media frenzy! 38 homes are destroyed, then 45, the numbers keep changing. Let the residents in for themselves so the media can know the truth! Regarding the San Bruno fire, if you look at Google Earth Street View, near the site of the rupture at Glenview Dr. and Earl St. the 1006 Glenview panoramic, you will note that the west side of the street has several large cracks in the sidewalk. This kind of damage is consistent with either earthquake fault activity or land slippage. Coincidently, the San Andreas fault runs about 300 yards west of this location. In addition, the east side of the street falls off into a steep ravine. Could earth movement contributed to pressure on the ruptured pipe? The fire from the gas line exploding is not surprising. I have a gas line in my backyard. It used to be a plane flew over once a week to monitor this line for leaks. I hanve't seen a plane in a long time. They also used to drive on the property and check the gas line. Again I haven't seen anyone in months. The indication from the company is it's because of the economy. How economical is it to wait until something like the California fire happens? Weeks/days of "gas smell" complaints, and no response? Where have I heard this one before - oh, yeah - BP! Remember Erin Brochovich? Now I know why my brother, Stephen H. Blinn (dec'd) had such contempt for your company. For shame! I grew up in san bruno and the whole story about smelling gas makes and pg&e not responding just seems wrong. in the 20 years i lived there,myself of my parents had to call pg&e because of the smell of gas and if they cannot respond right away, they instruct you to call the fire department immediately. the fire department has always responded within minutes and searched for a leak. its awful what happened and my heart goes out to all my friends and their families that have lost their homes. PLEASE DONATE BLOOD, FOOD, WATER, CLOTHES, TOILETRIES, ECT! Some people lost everything including loved ones.. San Bruno residents need the communities help! Let's all pull together!